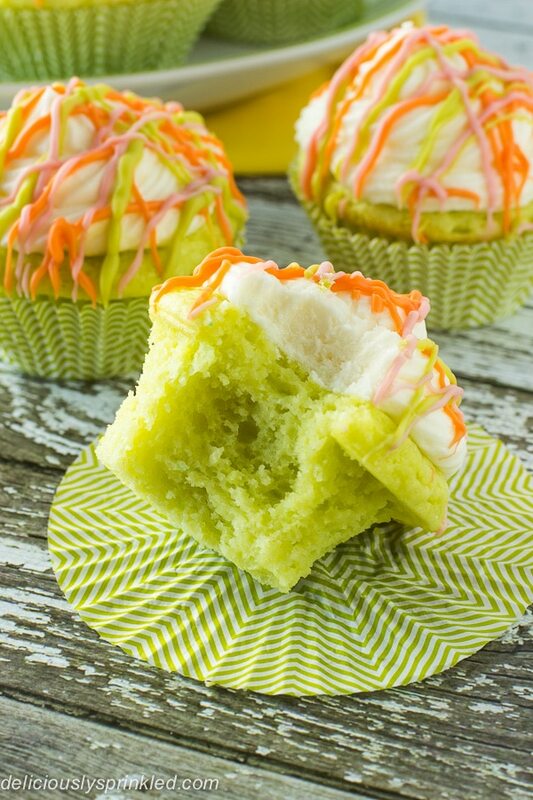 I’m totally on a lime kick right now, I don’t know if it’s because St. Patrick’s Day is on Monday or if I am ready for Spring to be here but either way these Lime Cupcakes are my new favorite cupcake of all time, yes I said it of all time! These cupcakes are super moist, and light with a hint of lime flavor, just like my Lime Cookie Bars. I topped them with my favorite vanilla buttercream frosting and drizzled them with pink, green and orange candy melts for an added sweet crunch. 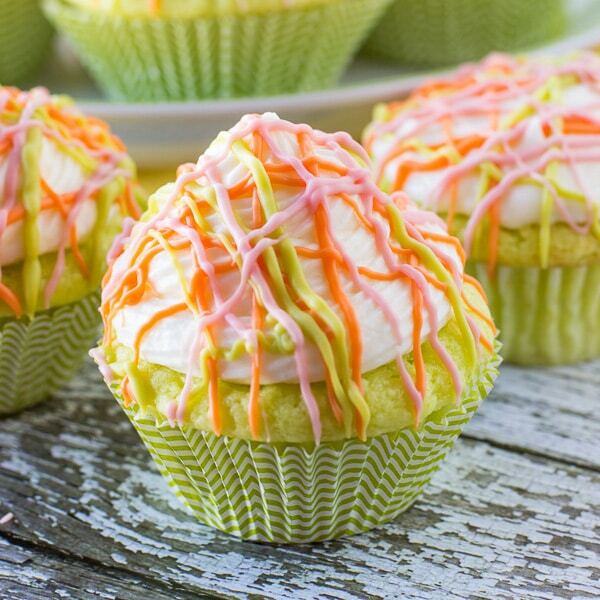 These lime cupcakes are fun, they’re colorful, and most important they’re delicious! Using an electric or stand mixer, mix the cake mix, vanilla pudding, oil, milk, sour cream and eggs until smooth. Pour cake batter into the cupcake liners (about ¾ the way full). Bake for 15 minutes or until a toothpick inserted near the center comes out clean. Allow to cool before frosting. Mix the softened butter on medium speed with an electric or stand mixer. Beat for about 3 minutes until smooth and creamy. Add powdered sugar, milk, vanilla extract, and salt. Increase to high-speed and beat for 3 minutes. Frost cooled cupcakes (I used Wilton 1M piping tip). Melt pink, green and orange candy melts in separate microwavable bowls in the microwave for 30 seconds, stirring until smooth. Drizzle each color on top of cupcake using a fork, let sit for 5 minutes to allow candy melts to harden before serving. I love love love the color of these cupcakes! They are so pretty! This recipe sounds so good, I want to try and make it for my son’s birthdat. One question, what size instant pudding do you use? Lime is one of those flavors that I always seem to forget about when it comes to baked goods! Which is a shame since I do love it – these look and sound delicious! Beautiful colors, Jenn! I have been loving all kinds of citrus-flavored things and limes are one of my favorites. Pinning these now!! Absolutely love these! Boxed mixes are my favorite way to start a cupcake! gorgeous colors Jenn! I can’t get over how stinking cute these are. I’m not afraid to use a boxed mix either because they’re so customizable! Do you add anything to your candy melts to get a smoother consistency when they’re melted? I always wind up getting thick globby messes when I try to drizzle because the chocolate never turns out silky. Box mixes can be great, especially when you can kick them up a notch by adding a couple more ingredients to make the mix even better! I sometimes add a teaspoon of shortening to my candy melts to give them a more smoother consistency. These cupcakes are so pretty Jenn – love the colorful and festive candy melts! 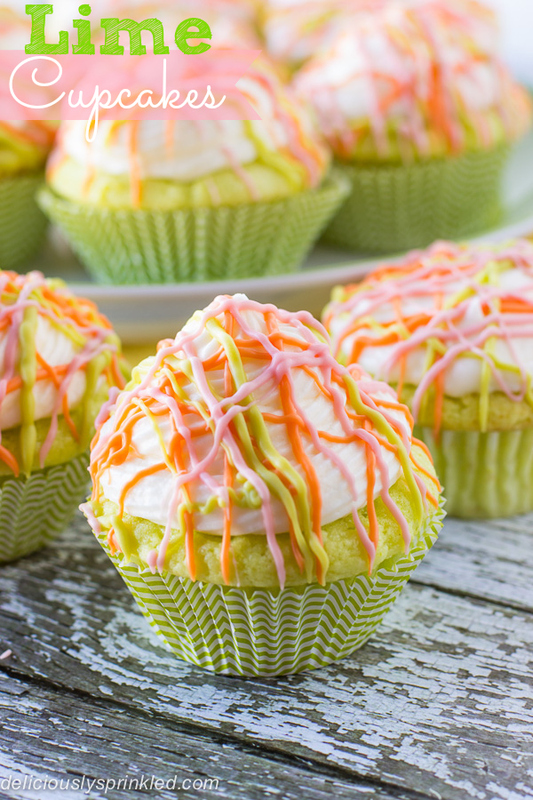 I am a big fan of lime/lemon desserts and these lime cupcakes sound delicious! I am so ready for spring to be here already too but since it’s still snowing where I am, these cupcakes sound perfect for bringng some warm sunshine to my day 🙂 Have a great weekend! The lime and frosting drizzle look amazing! I love the suggestion to add pudding mix and sour cream to liven up a cake mix, too!